The Hopup is one of the most dynamic and popular large format graphic displays due to its maximum impact with minimal effort. Hopup tension fabric displays come in a variety of sizes and are offered in straight and curved frames. Hopups require no totols for assembly, are lightweight and high portable and they pack away as easy as they set up. Hopups are easily accessorized with monitors, counters, tables and backlit options. Embrace is one of the sleekest collapsible portable displays and it delivers style with minimal effort. 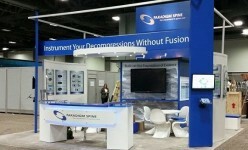 Embrace Fabric Displays come in a variety of sizes and are offered with or without end caps. Embrace requires no tools for assembly, is lightweight and highly portable. Embrace features crisp, straight edges due to the simple push to fit graphics. Space maximizing formulate exhibits incorporate sleek, straight aluminum frames with zipper pillowcase fabric graphics to create a sharp, bold backwall that clearly conveys who you are and what you do. With a variety of accents including graphic, headers, adjustable literature pockets, shelves, tables, counters and more, you are sure to find design that best suits your space. Premium retractable banner stands provide superior, high end functionally, features and durability, as well unique styling points for exceptional appearance. Premium banners include a protective, molded carry bag and feature a lifetime hardware warranty. Standard retractable banner stands incorporate customary features designed to provide everyday reliability, durability, and ease of use. Standard banners include mid-range canvas carry bag and typically feature a five year to lifetime hardware warranty. Economy retractable banner stands incorporate basic designs features, functionality and reliability. Economy banners include a basic carry bag and feature a 90 day hardware warranty. The Quick Stand is a quick and easy banner that also includes a carrying case to protect your image and investment. Standard graphic height = 78.5"